Everhard’s V-trim knives are used in tire manufacturing and other industrial applications. Selected models can be used with Everhard’s knife heaters if a heated knife is required. Wood handles are standard. Additional ergonomic handle options are plastic, and plastic with cushion grip. These handles will not spread contamination inside your plant. 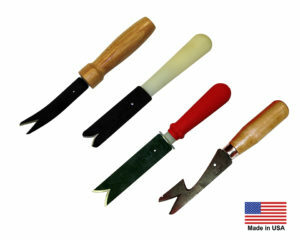 Insulated wood handles are also available. All knife handles are usable with Everhard heaters, except for the standard wood handle.